PALM SPRINGS, Calif. - The first thing you notice is how stark the course is. Not desert stark per se; there's plenty of green at the brand-new Escena Golf Club. More minimalistic stark. It's like lead Nicklaus Design Team project architect Bill O'Leary took his cue from the modern-take-on-the-1960s design of the future clubhouse. Escena gives golfers some wide, wide open fairways to shoot down. Has the celebrity-architect phenomenon gone mad? 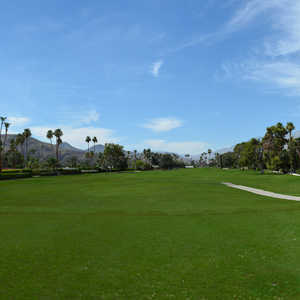 Palm Springs, an area that long believed a golf course wasn't a golf course unless there were enough palm trees on it to fill five South Pacific islands. Houses are on the way - aping that 1960s-rethink vision, but houses nonetheless. About 1,400 of them. The plans also call for the trees to take on a bigger role as they grow and multiply. Escena Golf Club may be the rare course that's actually better the sooner you play it. What's clear is that right now, this is a Palm Springs course you want to experience. Escena has It carries plenty of charm. And not just because it's the first new course within the Palm Springs city limits in more than a decade (the course-building long ago moved out to the La Quinta- and Rancho Mirage- type communities of the Coachella Valley). Escena's current look makes it unique. It's stark openness makes it easy to spot where your shot landed, keeping play moving. (On a busy day with a few Ben Crane wannabes lurking ahead, our foursome still finished in a very manageable four hours.) The as-yet-un-house-impeded views are nice, taking in the hills looming in the background and the thousands of tall white windmills (to harness wind power) on them. There's even a barbecue usually roaring right off the 10th tee. Escena hasn't been around very long. But it's already created quite the little scene. Escena starts out fronting as a tough guy. No. 1 is a 611-yard par 5 with desert brush featured prominently on the edges of the fairway. The starter emphasizes the handicap- rating suggestions for the various tees with a zeal usually reserved for a Pete Dye course. In truth, though, Escena's about as intimidating as a puppy dog trying to imitate Cujo. Even No. 1 looks more imposing on the scoreboard than it plays, being a straightforward journey to the green. "There are no forced carries," General Manager Jeff Sauvage said. "You can dribble them off the tee as a 25 handicapper and not lose a ball." Escena encourages golfers to go for it with five par 5s and five par 3s. Some of the par 3s could tempt a weaker hitter to break out a wood and swing away. Four of the five are at least 199 yards. Of course, just when you're all jacked up they throw the downwind 163-yard No. 8 at you. Trying to avoid the pot bunker right in front of the middle of the green can easily get a shot sailing over the green and down the hill. The biggest pleasures at Escena come from the surprises. It's coming up on No. 14, an uphill par 4 with water on the left and a little bridge running across, and realizing that the place is so new ducks haven't even discovered the pond yet. It's finding out that 18 is not only a finishing par 5 that gives you a shot at going out on birdie, but a picturesque one with a small, rocky creek running right across before the raised dogleg-left green. It's being right down the street from Palm Springs International Airport and having all this space. "I like that there's not so much housing out here," said Victor Niemis, a golfer from the San Francisco area. "It's more natural." At its $65 introductory rate, Escena was unquestionably the best value in the Palm Springs valley. Now that the ball's dropped on the New Year and the green fee is up to $95, it's not such a steal, but it's still a decent deal for peak season in this hot spot. Though not every golfer agrees. "At $65, it was just the right price," said Niemis, a Coachella Valley regular. "It's not worth much more than that. It's a nice little course." Escena isn't a showstopper. The 7,173 yards on the scorecard come off as something of a surprise once you play it. There are not a lot of holes where you're straining to reach the green. (Unless the winds kick up; then it's a whole different story.) But that's as much a credit to a design team that didn't try to mercilessly pummel average resort golfers as anything. What Escena does give you is a course in good shape, interesting greens (they are huge and often twice as wide as they are long or vice versa), great service from a Troon staff pulled from close and far, and that different, almost minimalist look. It's not a course for all tastes. But it's liable to become some modern-furniture-design-devotee's favorite course. And a fun break from the ordinary play for the rest of us. Escena's a five minute drive from downtown Palm Springs and a plethora of restaurant choices along the Palm Canyon Drive corridor. Park the car and walk from place to place, browse the menus outside and then make your pick. Selecting the restaurant is part of the fun here. There is something for almost every taste, from chains like California Pizza Kitchen (a Pete Sampras stop) to Kalura Trattoria Italiana, an open-air place next to the Plaza Theater with tasty, authentic pastas and desserts. If you're looking for seafood, head one street over to Fisherman's Market & Grill on South Indian Canyon Drive. This is a higher-end West Coast chain, with good if not great fish. Remember, this is the desert. Back on Palm Canyon, Kaiser Grill is a universal favorite. The big salads are particularly tasty. Skip the pizza and go for the meat dishes. If you want to be close to Palm Springs and its run of shops and restaurants, the Palm Springs Riviera (760-327-8311) is a very underrated choice. Its two-room suites, complete with private outdoor Jacuzzi, are some of the plushest accommodations you'll find in the whole Coachella Valley. This is where Dennis Rodman stayed when he was in town for a book signing. The standard rooms aren't nearly as luxurious as the suites (they've even got different carpet), but they are clean, with a great location (one block from Palm Canyon Drive) and a big outdoor swimming pool/courtyard area. Plus there are free pool tables in the open area just off the lobby. The Riviera is one of the most historic hotels in the area and you can see its Bob Hope/Elvis connection proudly displayed in photographs along the walls. Hotel Zosa, a new would-be cutting-edge boutique hotel, is drawing almost all the publicity in downtown Palm Springs right now. The Riviera is a much better deal and in some ways a more satisfying stay. Escena's back nine is more than 400 yards longer than its front nine. Three of the five par 5s and only two of the five par 3s are on the back. Yet some golfers feel the back nine scores easier.